Happy Pi Day! For my fellow non-geeks out there, Pi Day is March 14th, a holiday celebrating the constant 3.14..., the ratio of the circumference to the diameter of a circle. It's become somewhat of a nerdy tradition to make a pie (or just eat some) to celebrate Pi Day. I'll take any excuse to bake (I even made a rustic fruit tart last year for Pi Approximation Day), so of course I seized this opportunity. The fall-ish combination of apples, maple, cinnamon, and nuts might seem like an odd choice for mid-March. But Wendy picked it for our CCCP recipe club after finding herself with some fresh Upstate New York maple syrup (jealous! ), so I was excited to give it a try. Besides, there aren't a whole lot of other exciting fresh fruit options for pie fillings in early spring (rhubarb soon though!). 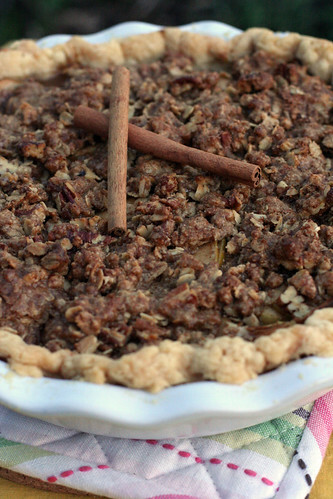 So allow me to present to you, in honor of Pi Day 2010, Maple Apple Pecan Crumb Pie. It's every bit as warm and flavorful as it sounds, and it has shattered my belief that fall flavors have no place in March. The pie filling and topping both contain sucanat, non-refined cane sugar. I had never heard of it before, but found it easily in the bulk section of my local hippie market and it just may be my new favorite sweetener. It looks sort of like a cross between brown sugar and turbinado. If you can't find it, use brown sugar instead. Feel free to use your favorite pie crust instead of the one I've shared here. I tried out The Pioneer Woman's recipe in my ongoing search to find a go-to, easy-to-work-with pie dough, and it was perfectly flaky and mild. What kind of pie are you making today? Do you use butter, shortening, or both in your crust? 2. Add in the shortening. Using a pastry blender, gradually work the shortening into the flour until the mixture resembles tiny pebbles. This step should take 3 or 4 minutes. 3. Lightly beat the egg with a fork, then add it to the mixture. Add in the water and vinegar. 4. Stir the mixture together with a wooden spoon until just combined, then remove half of the dough from the bowl. 5. Place in a large ziplock bag (do not seal) and slightly flatten with a rolling pin. This makes it much easier to roll out the crust later. After flattening, seal the bag tightly. Repeat with the 2nd half of the dough. 6. Place both crusts in the freezer. Leave one in there for the next pie you make. Freeze the other one for 20-30 minutes or until chilled, then remove from the freezer and the bag and place on a lightly floured surface. 7. With a rolling pin, begin rolling the dough from the center outward. Be gentle and patient, it'll take a little time to get the dough completely rolled out. 8. Using a nice, sharp spatula, loosen and lift the pie crust and carefully lay it over a pie pan. Using your hand, lightly form the crust so that it fits inside the pan and overlaps the edges. 9. Tuck the excess crust under, crimp the edges, or apply whatever decorative effects you like. Refrigerate until you're done making the filling and topping. In a mixing bowl, mix sliced apples with the lemon juice, and then add the sucanat or honey, cinnamon or apple pie spice, and flour and toss. Add the maple syrup and coat the apples well. Place the butter in a mixing bowl with the flour and sucanat and blend with a fork. Add the oats and cinnamon; mix well. Add the maple syrup and pecans. This should be a crumbly paste. 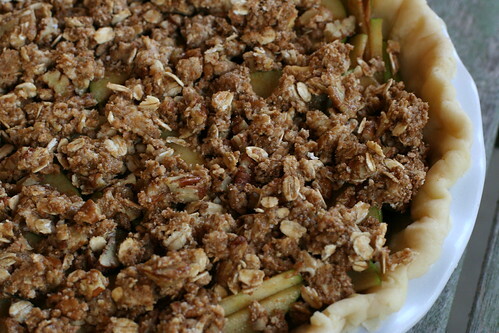 Pour apples into unbaked pie crust. The apple filling should appear to be over the edge of the pie pan. Press mixture with a spatula to ensure there are no air pockets. Cover the filling with Maple-Pecan Crumb Topping and bake in a preheated oven at 400°F for 10 minutes; then reduce heat to 350°F, place a pie crust shield on the pie if you have one, and bake for 50 minutes more or until the apples are tender. Let pie fully cool so its juices will set up before serving. Mmm it looks hearty and delicious!! Happy Pi Day Amy! I love this! Maple syrup (the real stuff) is always in our house and maple with apple is a killer combination =D. Happy Pi Day! I'm getting real upstate NY maple syrup next weekend - so I may have to try this soon. I use CI's foolproof pie crust - the one with the vodka. I love it! Happy Pi Day, Amy!!! I mentioned Pi Day in my food celebration post today. I may just have to include your link. Your pie looks oh so good!!! I mean really, Maple Apples and Pecans, sinfully yummy and, March is Maple Syrup Month to boot!!! I can't believe I forgot! Maybe I will make a pie for dessert tonight. This looks amazing! And in my opinion, any time of year is the perfect time to eat apple crumb pie!! Yum!! !